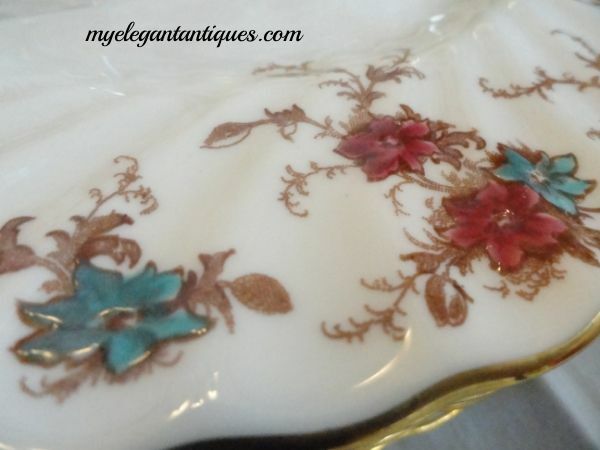 Minton’s Ancestral Pattern Vintage Enameled Porcelain Dinnerware was a highly popular design which was produced by the company for 40 years, from 1951 to 1991. 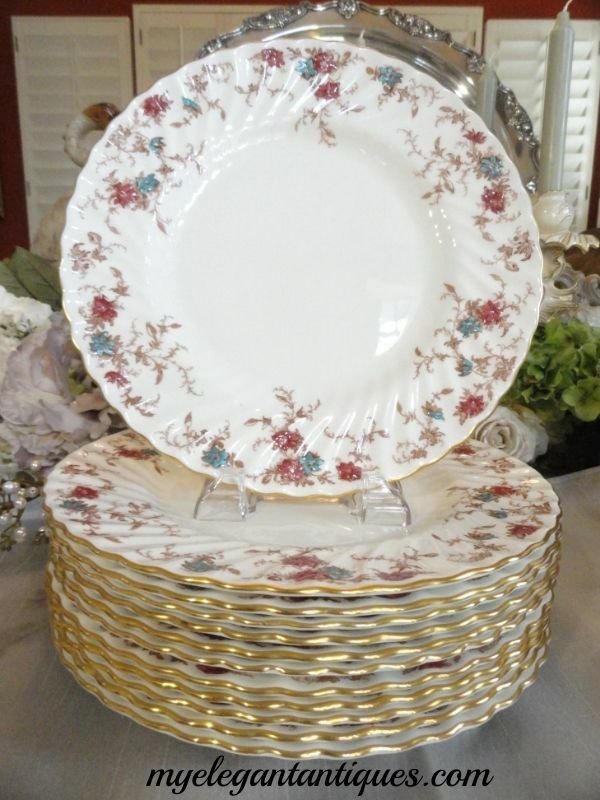 The popularity and longevity of this Minton Ancestral Pattern Vintage Enameled Porcelain Dinnerware were due to its elegant floral motif and graceful fluted rim design. 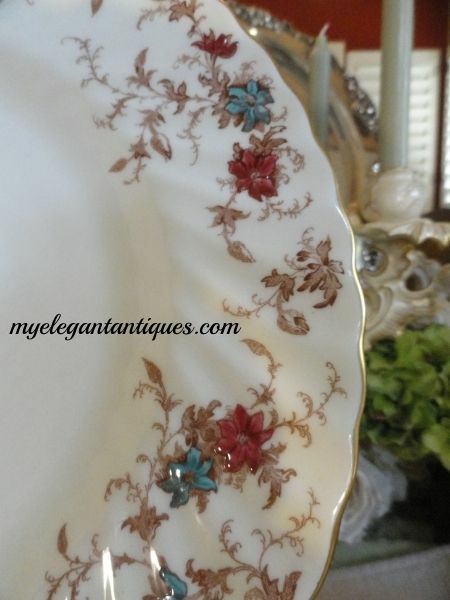 Set against a white background, Minton’s Ancestral Pattern Vintage Enameled Porcelain Dinnerware featured a floral transfer pattern of light brown, enhanced with enameled flowers in jewel tones of turquoise and ruby red. This stunning color palette lent itself to both traditional and contemporary environments, and accommodated a broad range of linens and crystal in many tones from the color wheel. 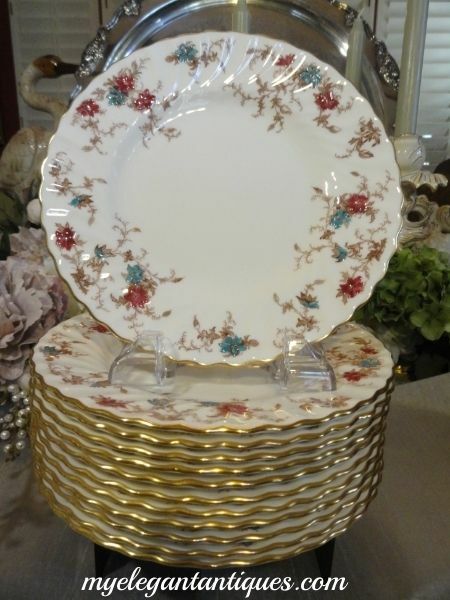 We are so very pleased to be offering this iconic Minton Ancestral Pattern Vintage Enameled Porcelain Dinnerware in a near-perfect, 61 piece estate set. 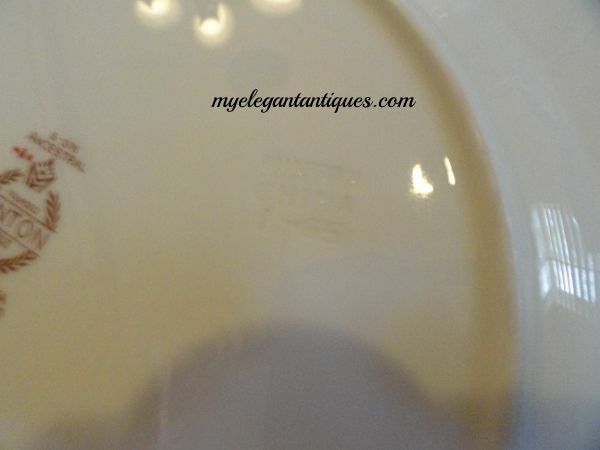 Yes, you can multiply - we are offering service for 12 in the Minton Ancestral Vintage Enameled Porcelain pattern! 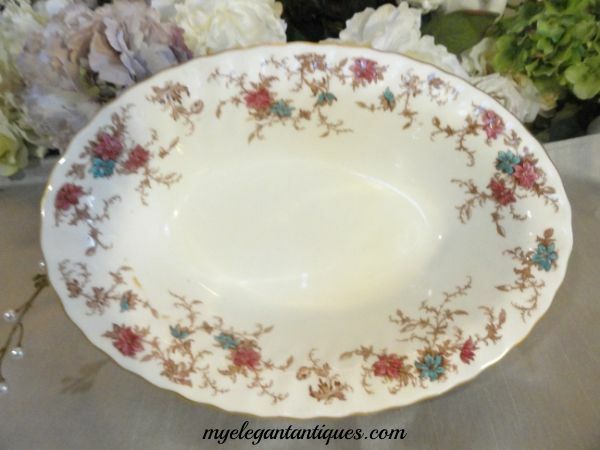 1 Minton Ancestral Oval Serving Bowl measuring 10-3/8” in length. 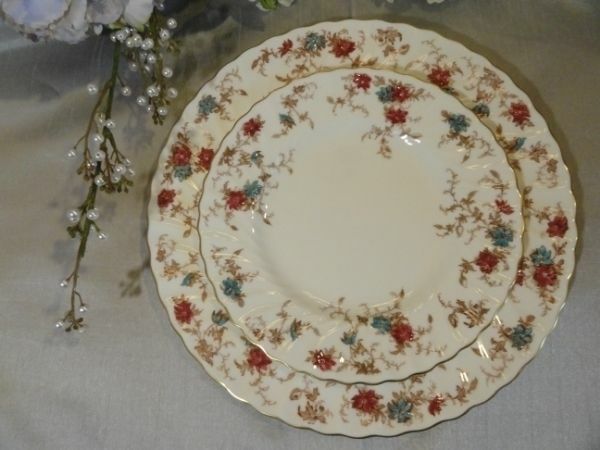 This Minton Ancestral Pattern Vintage Enameled Porcelain Dinnerware facilitates all your dining needs, from a romantic dinner for two, to a grand, blow-out Thanksgiving extravaganza! 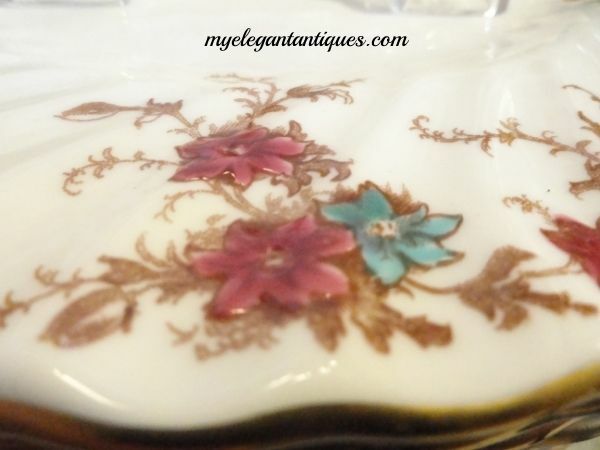 Our Minton Ancestral Pattern Vintage Enameled Porcelain Dinnerware, service for twelve (12), is in excellent condition, with no chips, cracks, crazing or discoloration. 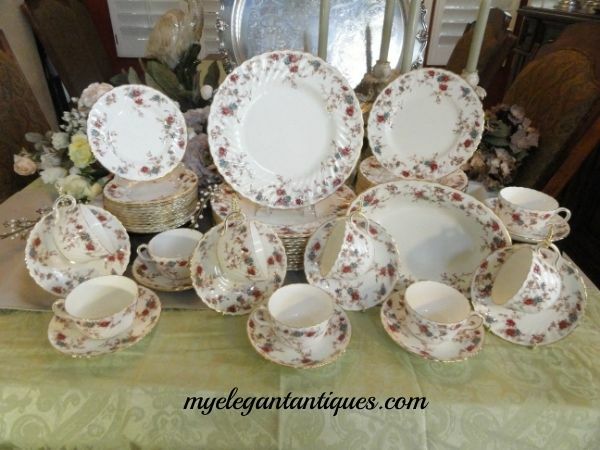 We have priced it to sell at $1100.00, which is an excellent price: a popular china replacement site is currently offering a smaller, 45-piece Minton Ancestral starter set (service for 9) and the oval serving bowl for a total price of $1,018.95! Peruse our photos carefully – we think you will agree that our Minton Ancestral service for twelve (12) is perfect, lovely and a bargain! 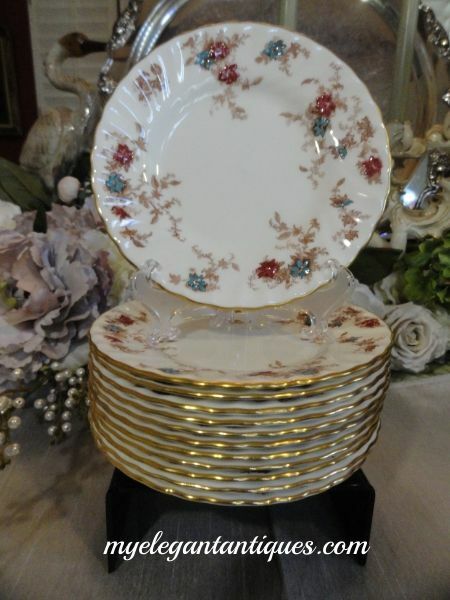 The shipping charge for this set of dishes is $60.00 to our customers who live within the 48 contiguous United States. 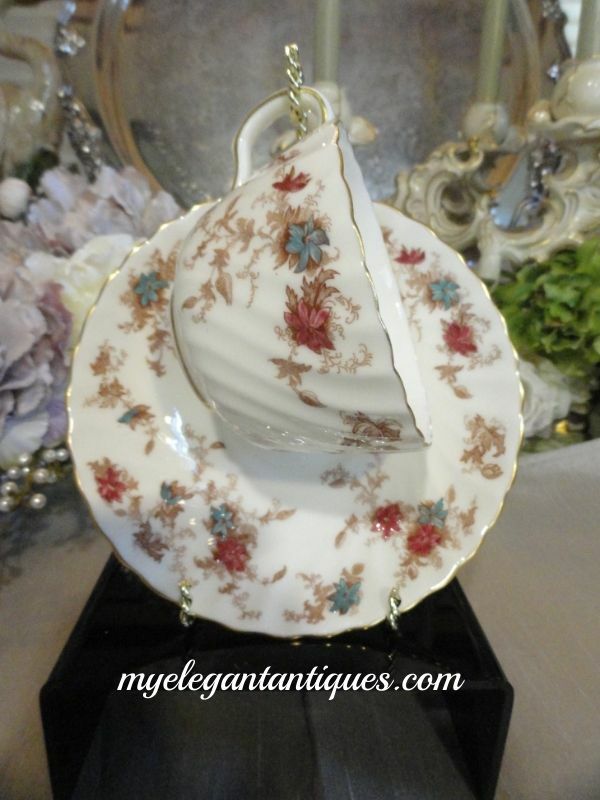 If you are an international customer, please email us at myantiquarians@myelegantantiques.com with your address so that we can prepare a quote for your shipping costs. Rest assured that we do not make money on shipping – in fact, we are certain that we will pay significantly more than we are charging. 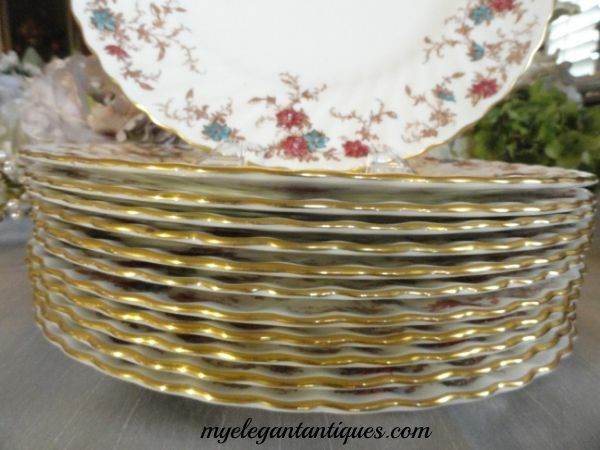 This large set of dishes will undoubtedly ship in five (5) or more large boxes, and each piece must be packed very carefully, to ensure that the entire set reaches you in the same unblemished condition it is in now. BRIEF HISTORY: Thomas Minton spent years as an apprentice with Josiah Spode, Josiah Wedgwood and other prominent potteries before he opened his own porcelain factory in 1793 in Stoke-on-Trent, England. Initially, Minton decorated earthenware blanks with blue transfer designs which he sold to London retailers. However, in 1798, Minton expanded into the production of porcelain products, producing creamware and transferware, in addition to stoneware, and hand-painted earthenware designs. When Minton died in 1836, he left his factory to his son, Herbert Minton, whose artistry and business acumen pushed Minton China to the forefront of the industrial age.